I think I will be eating lettuce for 14 days straight now. I guess that’s what I get for picking on iceberg. 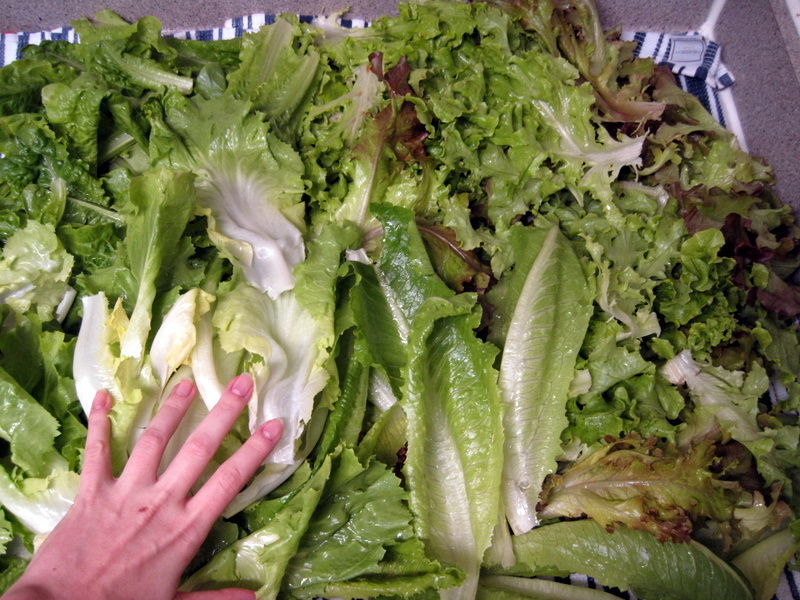 More than enough lettuce for a big salad… or ten. So not only has this been a good year for carrots, it has been a good year for lettuce as well. My fridge is now packed (no joke, I had to put the rest of my veggies in a cooler) with 1 head of green oak leaf lettuce, 1 head of red oak leaf lettuce, 1 head of romaine and 1 head of endive from today’s CSA plus several (as in 6-8?) small heads of green leaf lettuce from my mom. Iceberg Lettuce: Making a Comeback? My hand looks way creepy. That splotch near the knuckle is an oven burn, btw. If only I could trade you some scallops for some lettuce. Alas. I know! We could put together some awesome meals with my veggies and your seafood. Sigh.